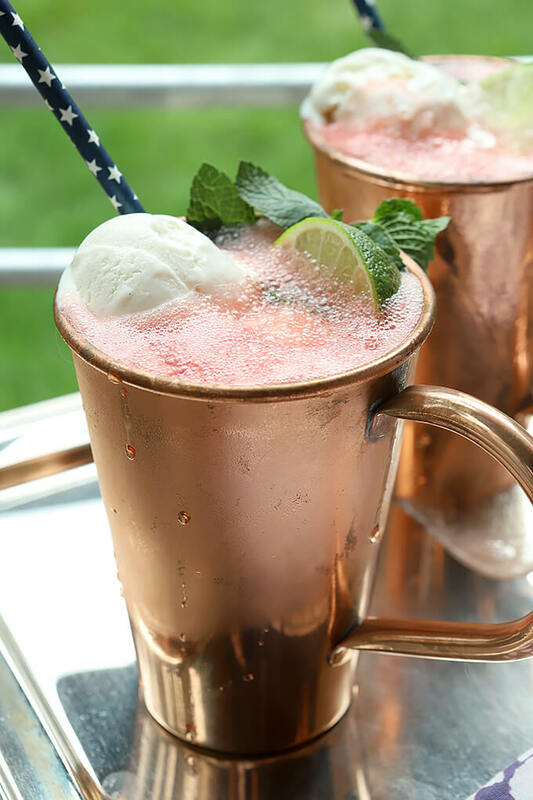 Grab a gorgeous fresh watermelon and make a Watermelon Moscow Mule Float or two immediately; they’re a light, fun adult beverage that are just perfect for the 4th of July or all summer long! This cocktail was inspired by a friend who made a watermelon float and showed me the photo. She knows I love to make (and drink!) cocktails, maybe didn’t know how much I love watermelon, but for me one of the best parts of her photo were the adorable star spangled sprinkles that she had adhered to the rim from the Del Cove Spice Company. I thought Anita’s Star Spangled Watermelon Gin Slush looked great and I admit I coveted some of those sprinkles, however, more than the sprinkles I simply could not get over the idea of combining watermelon and ice cream. I wanted it BAD. So I decided to do my own cocktail starting with those two ingredients. Funny but without purposely deciding to, and after a cursory run through of available ingredients, I ended with this dessert version of a Moscow Mule. I had everything on hand; always a plus so it was time to measure and pour some blended watermelon, vanilla ice cream, lime, vodka, and already chilled ginger beer. Why yes, that will do nicely, thank you very much! 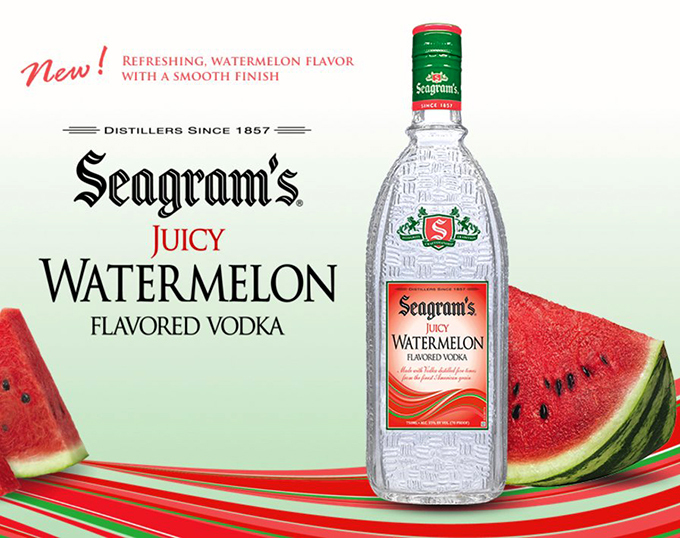 I decided to use the Seagram’s Watermelon Vodka that I had recently received from the brand. My neighbor and I thought we had to try it as a shot first and we liked it all by itself; I can imagine it would really be fun if ice cold; I’ll be keeping the rest of the bottle in the freezer. These are not premium vodkas but this one has a nice, sweet watermelon hint that was very pleasant. Admittedly I was late to the Moscow Mule craze; catching on only when the zingy drink started a resurgence a few years ago. I had never had a taste of one in my younger years, only being introduced with this honey vodka version in 2012. I was completely hooked and have discovered that it is a basic drink that does well with a lot of different fruit combinations, why not watermelon? Yes, why not watermelon? The end result was one of those combinations that if not for me knowing specifically that yes, indeed, there really was alcohol in there, it would have been easy to have downed the entire cocktail with a few swigs. Since finishing a ton of garden work this spring/summer I’m determined to get some photos outside and on this day it was hot and unusual for Colorado; a bit muggy after a late afternoon shower. By the time I finished; this was the perfect antidote to quench my thirst. Want a mocktail for friends who don’t imbibe or something for kids? Just mix it up without the vodka and you’re set. At the urging of friends who know how much I love to garden, I’m going to start including some photos and tips for things I’ve learned over the years; I hope you won’t mind indulging me; I promise it won’t be lengthy! My first tip is to share with you a secret for growing mint that keeps it from invading everything else in your garden. 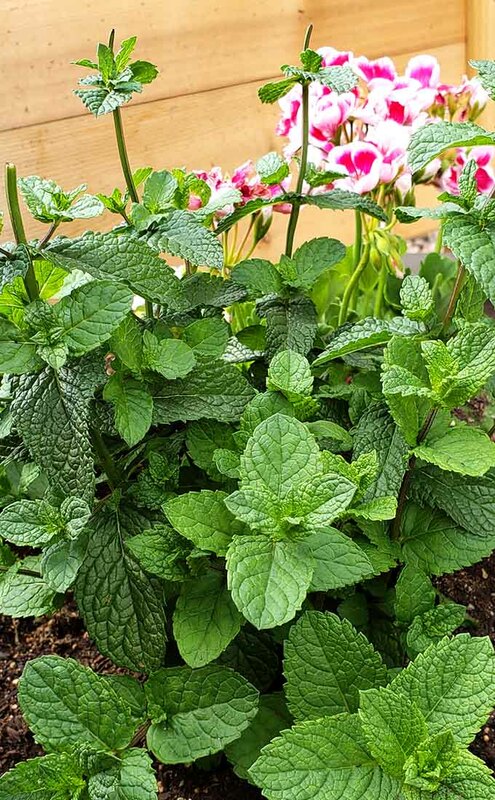 While my mint is currently in it’s own pot near an elevated planter with other herbs, once I decide on garden space I will put it in the ground. If you know how much mint can get out of control that might seem a recipe for disaster but it’s easy to contain; simply contain it before you dig your hole! I use a 5 gallon paint bucket from Home Depot; dig a hole large enough to sink the entire bucket, leaving a couple of inches above ground level and then fill the bucket with good dirt and plant your mint plants in the bucket. It will thrive in the space of that bucket, should come back each year too, but will not branch out via roots and get a foothold anywhere else in your garden. I had one year when some longer shoots hanging over the edge starting rooting but I just pulled them out and cut them off. Worked for me for 23 years at my former home and will again in this garden I’m sure! Having fresh mint outside is wonderful; it’s such a refreshing addition to salads, desserts, ice tea, and cocktails! 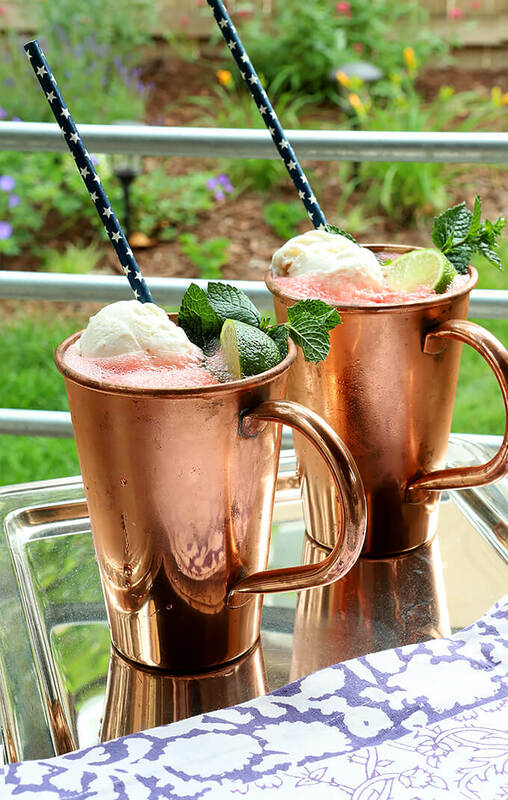 Grow your own and it’s just a quick trip outside to gather mint for this Watermelon Moscow Mule Float! 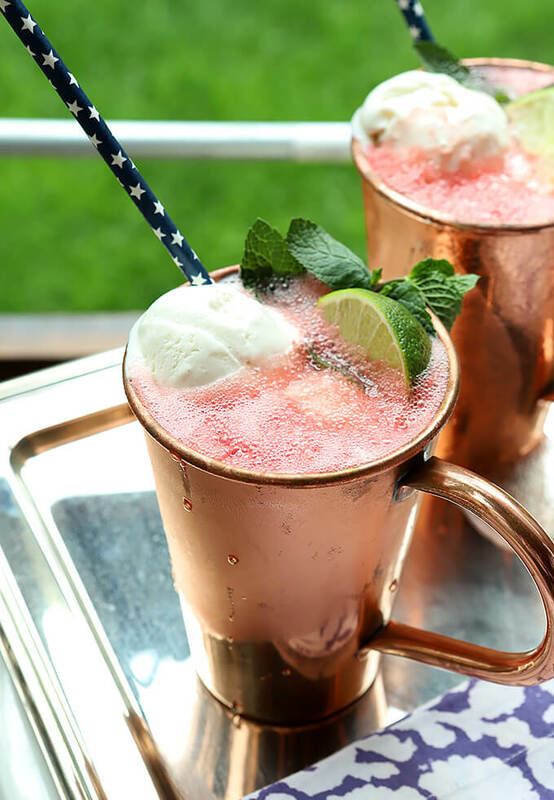 The post Watermelon Moscow Mule Float appeared first on Creative Culinary.